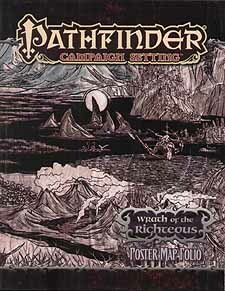 Explore the corrupt terrain of the Worldwound, one of the most terrifying lands in the Pathfinder campaign setting, with the Wrath of the Righteous Poster Map Folio. Study the alien home of the demons, make a stand inside a doomed city or plot your crusade on three massive poster maps designed for use with the Wrath of the Righteous Adventure Path. Huge, lavishly illustrated poster maps depict the crusader city of Kenabre (the setting for the first Wrath of the Righteous adventure) and the Abyss-touched territory of the Worldwound. The third map is a giant player-oriented illustration of the Abyss itself, presented as an ink-and-parchment drawing of this other worldly realm of ultimate evil and its hideous denizens! Whether you're looking for an embattled but defiant city or a mysterious extraplanar realm, these beautiful maps are the perfect resource for the Wrath of the Righteous Adventure Path or any fantasy campaign.